outscheme, verb (used with object), -schemed, -schem·ing. 1, 6. See plan. 2. stratagem, cabal, conspiracy. 5. pattern, schema. 10. See plot1 . 1553, "figure of speech," from M.L. schema "shape, figure, form, figure of speech," from Gk. skhema (gen. skhematos ) "figure, appearance, the nature of a thing," related to skhein "to get," and ekhein "to have," from PIE base *segh- "to hold, to hold in one's power, to have" (cf. Skt. sahate "he masters," sahah "power, victory;" Avestan hazah "power, victory;" Gk. ekhein "to have, hold;" Goth. sigis, O.H.G. sigu, O.N. sigr, O.E. sige "victory"). The sense "program of action" first is attested 1647. Unfavorable overtones (selfish, devious) began to creep in early 18c. The verb, in the sense of "devise a scheme," was first recorded 1767. Color scheme is attested from 1884. 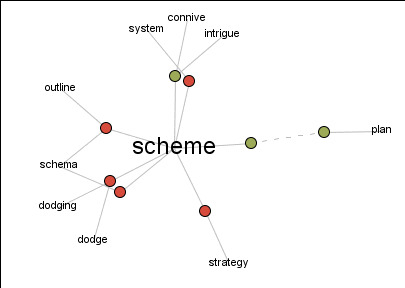 (Originally "Schemer", by analogy with Planner and Conniver). A small, uniform Lisp dialect with clean semantics, developed initially by Guy Steele and Gerald Sussman in 1975. Scheme uses applicative order reduction and lexical scope. It treats both functions and continuations as first-class objects. Mailing list: scheme [at] mc [dot] lcs [dot] mit [dot] edu.